The prospect of a “grand bargain” could rear its ugly head if the 2014 midterms empower Maine’s Angus King. American politics is more diverse, more nuanced and more interesting than most media and political elites choose to note. This country elects Libertarians and Greens and Socialists and independents, along with Democrats and Republicans. And 2014 could produce results that put independents in a pivotal position in the US Senate. But not all independents are alike. And this reality could have critical consequences for debates over the future of Social Security, Medicare, Medicaid and a whole lot more, consequences that ought to understood by everyone who is playing the Senate-control numbers game. To be sure, there are Republicans in the Senate—and running for it—who have indicated a willingness to mess with vital programs. But don’t assume that a Senate where independents hold the balance of power would necessarily preserve those programs. It could be more prone to the mangling proposals of the Simpson-Bowles commission. 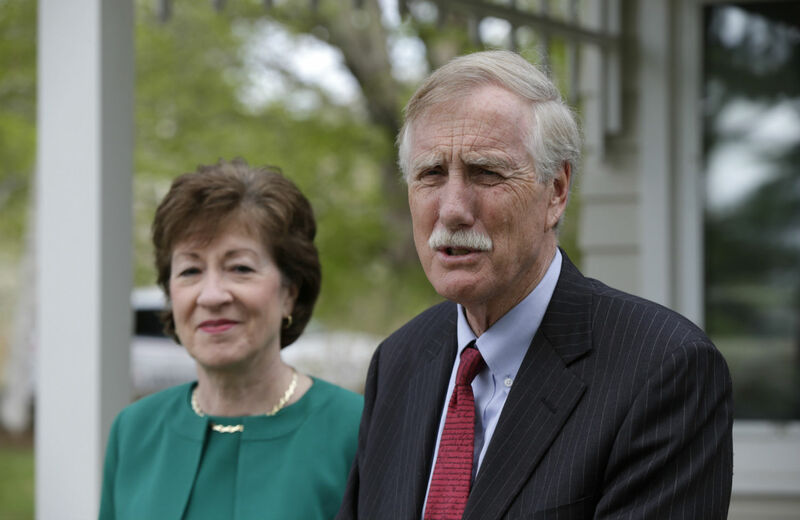 There is good reason to be concerned that some independents, led by Maine Senator Angus King, could use their newfound authority in a closely divided Senate to promote the sort of “grand bargain” that has long threatened Social Security as we know it. With the 2014 Senate competition hurdling toward November 4—when control of the chamber may or may not be decided, depending on potential runoffs in Georgia and Louisiana—the focus on independent candidacies has spiked. If Democrats and Republicans finish with even numbers of senators, even if a party has a one-seat advantage, a couple of ambitious independents could become definitional players. As of now, one independent contender is polling well enough to be considered a serious prospect for election to the Senate, while another looks to be competitive in a wildly unsettled race. Kansas independent Greg Orman has been running even with Republican Senator Pat Roberts in a contest where the Democrat dropped out. And Republican South Dakota Senator Larry Pressler, who served as a Republican but backed President Obama twice, has retained credible numbers in a multi-candidate field for his old seat. In Kansas, Orman has received a great deal of support from Democrats since their party’s candidate dropped out, and he is certainly more progressive than Roberts. Pressler, on the other hand, is trying to find his way around conservative Republican Mike Rounds and populist Democrat Rick Weiland. If either Orman or Pressler were to win, they would join two New England independents, King of Maine and Bernie Sanders of Vermont, in the 100-seat Senate. This possibility has fueled fanciful talk about the prospect of developing a so-called “independent caucus,” which might try to leverage change in a tightly divided Senate. Similar legislative coalitions have developed in other countries, notably Ireland (where rural independents and urban anti-austerity radicals have gained increasing strength), and the prospect is intriguing. But it is not without peril. King is a mixed-bag centrist who previously served as the independent governor of Maine. He caucuses with the Democrats currently, but says he might caucus with a Republican majority if he thought that was best for Maine. Notably, King has endorsed Maine’s Republican senator, Susan Collins, as well as Tennessee Republican Lamar Alexander, for re-election this year. When asked which party he’d like to work with as the new Senate organizes, King is coy. “I’ll make that decision at the time based upon what I think is in the best interest of Maine,” is all he says. King has counseled Orman and Pressler to be equally elusive, according to media reports that portray him as a something of an independent guru. It is not unreasonable to suggest that King and another independent (or two) might move as a block—perhaps into the caucus of one party or another, perhaps as a more genuinely independent swing caucus, perhaps as part of a broader “centrist caucus” including independents, Republicans such as Collins and Alexander and Democrats such as West Virginia’s Joe Manchin. King, who is not without ambition, could emerge as a definitional player in the next Senate—which, on some campaign and ethics reform issues (he backs of a constitutional amendment to overturn the Supreme Court’s Citizens United ruling and address the overwhelming influence of money in politics) could be good. Unfortunately, when it comes to budget issues, King has steered too frequently in the direction of the austerity agenda advanced by former Republican Senators Alan Simpson of Wyoming and former Clinton White House Chief of Staff Erskine Bowles. Simpson and Bowles both backed King’s 2012 campaign. If a newly empowered King were to become the “bridge” Simpson and Bowles have been looking for, if he were to steer Congress toward a “grand compromise” that began to compromise Social Security, Medicare, Medicaid and the social safety net, the byproduct of the Maine senator’s increased influence could be far more damaging than the gridlock to which he so objects. That’s why it matters that the longest-serving independent in the history of the US Congress, Vermont’s Sanders, shows far less interest in jockeying for position than in using whatever influence he has to protect seniors, help workers and assure that budgets are not balanced by taking from the poor and giving to the rich. to caucus with that party that will most likely support a major federal jobs program putting millions of Americans back to work rebuilding our crumbling infrastructure; supports overturning the disastrous Citizens United Supreme Court decision; supports raising the minimum wage to a living wage; supports pay equity for women workers; supports a single-payer national health care program; ends our disastrous trade policies; addresses the grotesque level of income and wealth inequality; and is prepared to aggressively address the international crisis of global warming. Sanders gets it. It’s valuable to bust the boundaries of a broken two-party system. It’s meaningful when voters elect Greens, Libertarians, Socialists and independents. But if empowered independents turn an obsession with ending gridlock into an excuse for making unacceptable compromises and advancing bad policy, America is no better off.